This political documentary is about the search for an ideal communism and how it has never been found in practice. The film begins with the secret police file on the grandfather of a young Bulgarian woman. He sympathized with the Bulgarian Socialists in 1920s, but after seeing the damage the Communist Party caused during World War II, he joined the Goryani anti-communist resistance movement in the Bulgarian mountains. 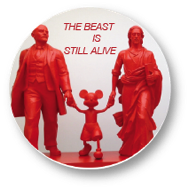 Using animated sequences and a semi-mystical dialogue in voice-over between the young woman and her dead grandfather, The Beast Is Still Alive shows how young generations keep rediscovering communist ideology against the backdrop of discredited politicians and former agents of the secret police. The young woman’s attitude towards the political alternatives to capitalism grows increasingly complex.